This guy is healthy: Junior Charles Dewhurst is sporting a brace on his left leg but can fully participate in practice now. Dewhurst had season-ending knee surgery last January. On Monday, Dewhurst appeared very comfortable on the court, collecting several offensive rebounds, running the floor well and he appeared very at ease with his outside shot, connecting on three of four 3-pointers. 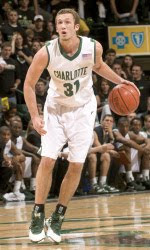 In his first two seasons with the 49ers, Dewhurst has been more likely to drive to the basket. This guy can jump: Freshman K.J. Sherrill looks in excellent physical shape and is very good playing above the rim. He has been blocking shots, altering others and has a nice mid-range jumper. With 1.1 seconds left during one 5-on-5 game, Sherrill caught a halfcourt pass from Phil Jones over two defenders, turned and got a good look at the basket but the ball bounced off the left side of the rim. There is no stopping this guy: Senior point guard DiJuan Harris hasn't lost any intensity. He was as relentless as always, driving to the basket among much taller players, diving for loose balls and disrupting the other team on defense. Twice he took hard spills to the floor but got right back up and continued on. This guy looks familiar: The more I see of sophomore transfer Derrio Green, the more he seems to have a game very like that of former 49er Leemire Goldwire. He is very active with the ball and comfortable taking the shot when needed. Green even looks a little like Goldwire. This guy is funny: After practice several players were taking turns dunking the ball and discussing who would be good in Thursday night's dunk contest during Basketball Madness. At one point freshman Shamarr Bowden started dunking and Phil Jones ran up to him, flailing his arms wildly and screaming, "No dunking Shamarr! You shoot 3-pointers. That's what you do." Reminder: Basketball Madness begins at 9 p.m. on Thursday night at Halton Arena. Fan Day, which will including scrimmages, is 11 a.m. Saturday at Halton Arena. This guy is a class act: DiJuan Harris. I hope to see him on the coaching staff after he graduates or soon there after. I am happy to hear about "Dewberry". Great kid. bad luck. Shake the tree Charles! "NO REBOUNDING PHIL! YOU SHOOT 3 POINTERS! THATS WHAT YOU DO!!" "NO POST MOVES SHAMARI! YOU SHOOT 3 POINTERS! THATS WHAT YOU DO!!" "NO FREE THROWS IAN! YOU SHOOT 3 POINTERS! THATS WHAT YOU DO!!" "NO DRIBBLE DRIVES ANJUAN! YOU SHOOT 3 POINTERS! THATS WHAT YOU DO!!"